Photo of the Day: Chocolate Show! 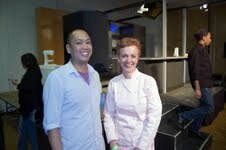 OK, not exactly my best photo, but damn if it wasn’t one of the highlights of the Chocolate Show – getting to meet Chef Vicki Wells! ← Next Baking Class: Apple Pie! Dec. 5th!